Severe thunderstorms killed 17 people in Missouri and produced multiple damaging tornadoes in Iowa on Thursday. 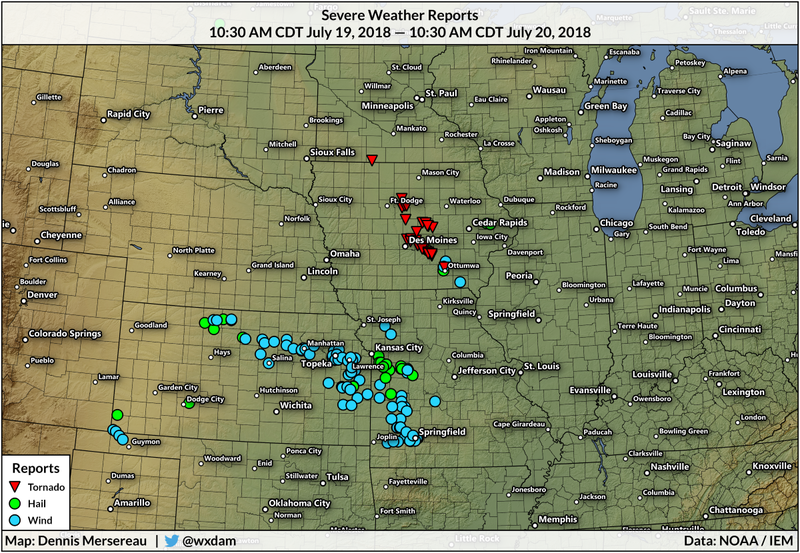 The destructive but non-fatal tornadoes in Iowa got more coverage than the deadly thunderstorm in Missouri in large part because the tornadoes were well-documented in excruciating and dramatic detail. More severe weather is possible during the day on Friday across the Ohio Valley. Thursday was a bad day for severe weather in the United States. 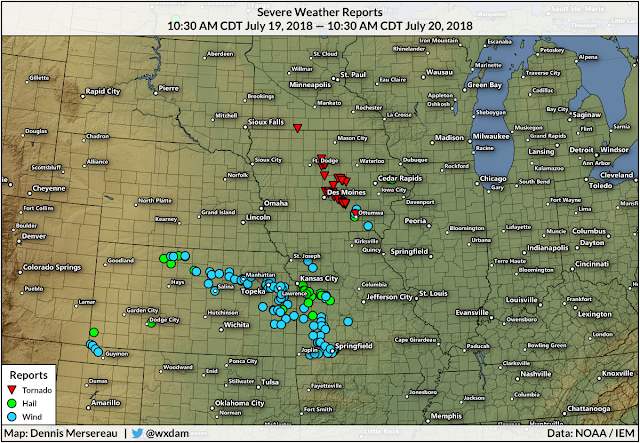 Multiple tornadoes touched down across central Iowa on Thursday afternoon. At least two of the tornadoes were particularly destructive, destroying buildings and tossing parked cars several hundred feet. All of the damaging tornadoes were caught on video in vivid detail. The tornadoes were strong, but the frenetic reaction on social media and from some news outlets in the hours after the storms was a bit much relative to what happened. The Associated Press' story on the tornadoes repeatedly calls the tornadoes "unexpected." The forecast called for a low chance of tornadoes on Thursday—the risk for hail was supposed to be higher—but meteorologists issued a tornado watch ahead of the storms and each tornado was warned well in advance. The number and intensity of tornadoes was unexpected, but the tornadoes absolutely didn't come without warning. The tornadoes in Iowa on Thursday struck a nerve on social media for a few reasons. The weather has been boring lately. I wrote a post about the "summer doldrums" the other day, the period in July when the weather is active but usually boring and repetitive. There also haven't been that many tornadoes this year. We've only seen 55-60% of our normal number of tornadoes so far in 2018. The lack of exciting weather and relative lack of tornadoes amplifies an event like we saw yesterday. There were also multiple HD videos shot from pretty much the outer circulation of the tornadoes. The people who took the videos likely would have been injured had the tornadoes shifted a few dozen yards closer to them. We watched in striking detail as homes violently shredded apart and dazed survivors surveyed parking lots full of overturned cars that had come to a rest just seconds earlier. We've always had dramatic videos of violent weather from up close. But even this far into the smartphone era we're still getting used to being inundated with views from every angle of a natural disaster. The raw, realtime quality of the videos we saw yesterday—watching the storms march into towns on radar and then watching videos of the destruction a few minutes later—seems to have resonated quite a bit with a lot of folks, especially those in online media. The Iowa tornadoes wouldn't have gotten half the attention they received if it weren't for the captivating videos. I can say that with confidence because, while nobody died in the storms in Iowa, storms at the same time in Branson, Missouri, killed 17 people and that tragedy didn't get a fraction of the attention until today. Divers are still searching Table Rock Lake near Branson, Missouri, after a tourist boat capsized in high winds during a severe thunderstorm on Thursday evening. Out of 31 people on the boat, 14 survived, 13 bodies were recovered, and crews are still searching for four who are missing and presumed dead. This was one of the deadliest severe thunderstorm-related incidents in the past several years. To put this storm in perspective, no single tornado has killed as many people as that one severe thunderstorm since 24 died in the EF-5 that hit Moore, Oklahoma, on May 20, 2013. Despite the boat company's statement that the storm came on suddenly, a severe thunderstorm warning was issued for the area at least half an hour before the onset of high winds. The threat for severe weather isn't over yet. 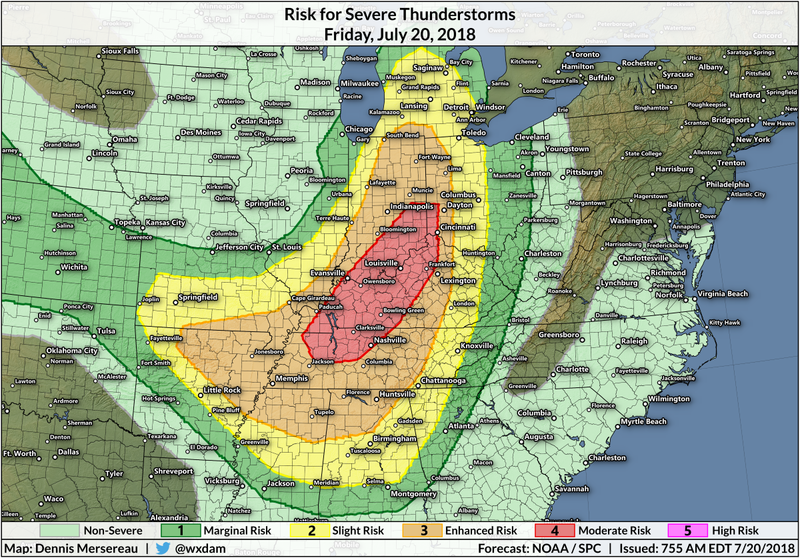 A moderate risk for severe weather is in place across the Ohio Valley on Friday as severe thunderstorms develop through the afternoon hours. Some of the storms will be supercells capable of producing very large hail, tornadoes, and damaging winds. The moderate risk was issued due to the potential for hail the size of golf balls or larger. The greatest risk for tornadoes exists in the moderate risk zone along and near the Ohio River. A risk for all modes of severe weather exists far outside of that bullseye over the river, stretching as far south as Montgomery, Alabama, and as far north as central Michigan. There's No Excuse For "We Had No Warning"
We are saturated with weather information these days. 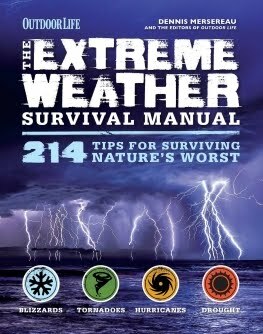 There's no excuse for anyone to be caught off-guard by severe weather anymore. Most dangerous storms are warned in advance. When people say they had no warning, they really mean they didn't hear the warning. The best way to keep up with severe weather is to check the forecast every day and keep an eye on products and forecasts issued by the Storm Prediction Center. Always make sure you have a way to receive severe weather warnings, whether you're at home, school, work, or out and about. All modern smartphones are equipped with emergency alert capability. Keeping a weather radio capable of alert mode is a good idea for homes, businesses, and RVs. Even if you have no cell coverage and you're not paying attention to the weather, most areas receive a weather band signal and the devices can sound a loud siren when a watch or warning is issued for your county. Very few storms truly come from nowhere. A severe weather warning is only good if we hear about it.